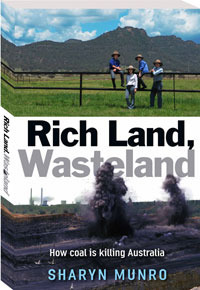 This is the story of the terrible way the coal mining and coal seam gas industry tramples on the land and people. It just seems shocking that this industry can have access to private land. The book is written from the victims perspective. When travelling through the Hunter region of NSW I was appalled at the coal mines size and felt that it is not right that such scars should be permitted, I had read elsewhere of locals trying to stop these companies coming on their land, but didn't realise how terrible this industry is nor the extent of how Governments bend to the wishes of the miners at the expense of the lives of citizens and the land. It seems Governments are even worse in doing their job than I thought. There are terrible things happening all around the world for the sake of progress and the wealth of a few. Australia is now firmly in the sights of the avaricious, the greedy and the ruthless in the form of coal and CSG companies. Beautiful places like the Hunter Valley have already been destroyed and others like the Pilbara, Bimblebox and Margaret River are next on the chopping block. We need to be aware of what has happened and what is about to happen and this sad book unfortunately outlines the mess we have found ourselves in. Every Australian should read it and be angry.